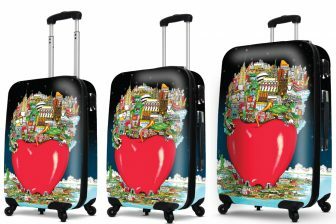 Visionair Luggage, an exciting new player in the travel goods market, is proud to announce the signing of a new licensing deal with internationally renowned 3D pop artist Charles Fazzino. Specializing in contemporary design, durable construction, and exceptional customer service, Visionair will have a significant impact in the high-growth hard-side luggage category. Currently selling to specialty shops , department stores and local retailers, Visionair plans to expand the market with an exciting, vibrant, and exceptionally functional new luggage sets inspired by the art of Charles Fazzino. The relationship and preliminary designs will both be unveiled at the upcoming International Travel Goods Show in Phoenix, AZ, March 11-13, 2014. Charles Fazzino — one of the most popular artists in the world — is most well-known for his unique, detailed, and vibrant three-dimensional style. His work is exhibited in hundreds of fine art galleries and museums in twenty different countries. He is an officially licensed artist of the National Football League and the Super Bowl (2000-present), Major League Baseball and the MLB All-Star Game (2003-present), and the US Olympic Team (2000 to present) . He has also recently created official artwork for high profile events, including: the Centennial Celebration for the City of Fort Lauderdale, the Pori Jazz Festival, CMA Awards, Grammy Awards, and Daytime Emmy Awards. 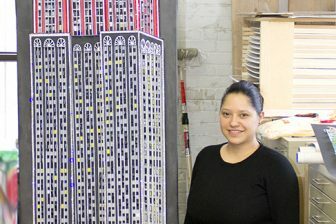 He recently installed his largest full sized installation in the American Airlines Terminal at JFK International Airport in NYC. You can view more of Fazzino’s work at www.fazzino.com. Visionair luggage was created by Tom Nebeling out of a need to develop lightweight, durable and functional luggage without compromising fashion. The company prides itself for producing leading edge travel goods and for spearheading the growth of such trends as hard-side luggage. High quality products and dedicated customer service are the core values of the executive team which offers a wealth of experience in the luggage industry both internationally and domestically. Visionair Luggage is headquartered in New York City and has a warehouse in New Jersey. Visit www.visionairluggage.com.